Tinted vs. Polarized Glasses – What’s Better? Polarized tints have special glare-reducing features that standard or gradient non-polarized tints don’t provide. If you find that your vision is hampered by glare from the sun bouncing off bright, light surfaces, then polarized lenses would be a great choice for you. Go to the dollar or drug store, get one pair of sunglasses that has polarized lenses – a sticker or tag on the glasses should indicate whether the lenses are polarized – and one that has non-polarized tinted lenses. Here’s a little trick you can do to determine if lenses are polarized: hold two pairs of sunglasses that both say they come with polarized lenses. Hold them with one pair of glasses right in front of the other. 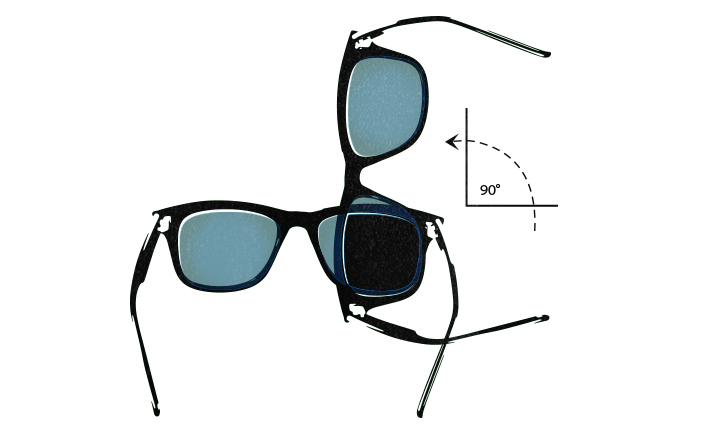 Now turn one pair 90 degrees, so the two pairs of sunglasses are perpendicular to each other. If the part where the two lenses are over each other becomes darkly opaque, almost completely black, you can be confident that they are both polarized lenses. This works because the molecules that create the polarization effect are in (invisible) vertical rows on the lens. That’s how it can block horizontal glare! So do a little experiment to see if you notice any difference between polarized and non-polarized sunglasses. If you do just fine with standard or gradient tints, that’s great: Our standard tint is $4.95, while our gradient tint is $7.95. Our polarized lenses are a little more expensive: They start at $32.99, for 1.50 index single vision lenses in gray or brown, to $102.00, for the 1.59 pure polycarbonate polarized progressive (no-line bifocals) lens. Of course you can always telephone us, at 1-800-211-2105, and any of our customer service representatives will be happy to discuss these lenses with you.